Modeling is a cognitive process during which the trainee encodes information about a skill during observation. 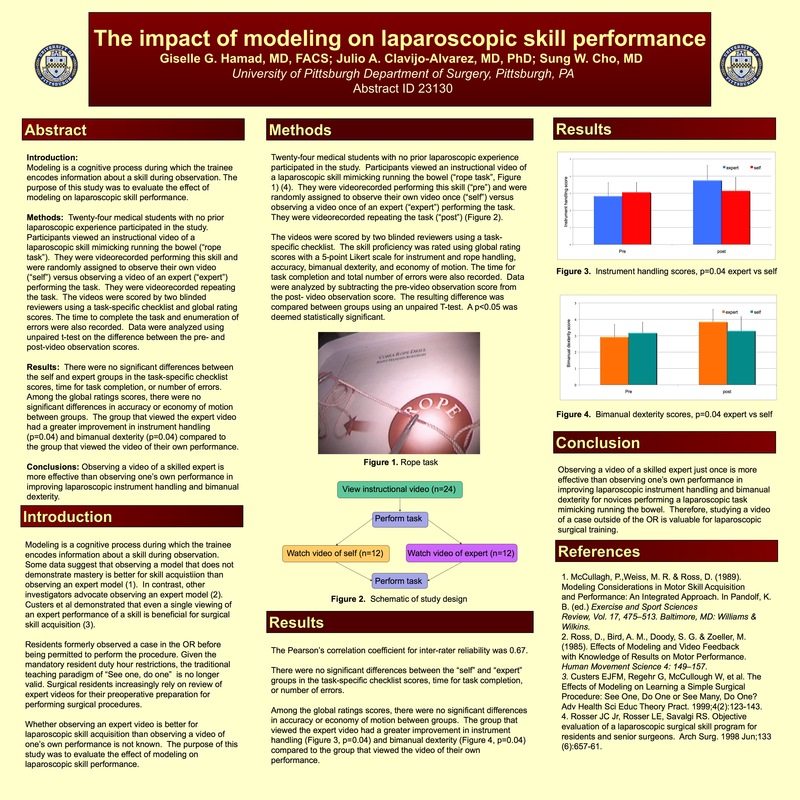 The purpose of this study was to evaluate the effect of modeling on laparoscopic skill performance. Methods: Twenty-four medical students with no prior laparoscopic experience participated in the study. Participants viewed an instructional video of a laparoscopic skill mimicking running the bowel (“rope task”). They were videorecorded performing this skill and were randomly assigned to observe their own video (“self”) versus observing a video of an expert (“expert”) performing the task. They were videorecorded repeating the task. The videos were scored by two blinded reviewers using a task-specific checklist and global rating scores. The time to complete the task and enumeration of errors were also recorded. Data were analyzed using repeated measures of ANOVA. Results: There were no significant differences between the self and expert groups in the task-specific checklist scores, time for task completion, or errors. Among the global ratings scores, there were no significant differences in instrument handling, accuracy, bimanual dexterity, or economy of motion between groups. The group that viewed the expert video had a greater improvement in rope handling compared to the group that viewed themselves (p=0.02). Conclusions: Observing a video of a skilled expert is more effective than observing one’s own performance in improving laparoscopic object handling.